Ed Herbst writes: When fly anglers catch up to 60 yellowfish a day on the Orange River in the Richtersveld and when yellowfish rise to dry flies on the Sterkfontein Dam near Harrismith in the Orange Free State, is seems scarcely credible that, three decades ago, it was widely believed that yellowfish would not take a fly. If the Walker’s Killer is South Africa’s most iconic fly then Theo van Niekerk’s TVN nymph, which was tied to imitate a fresh water mussel, Corbicula fluminalis, found in the Vaal River, was the fly of the century. It was to have a profound impact throughout the country and its influence endures to this day – not because of its intrinsic qualities as a fly or because it possessed any specific powers of attraction, but because it changed a mindset. Prior to Van Niekerk’s pioneering efforts in catching yellowfish on the fly it was accepted that this was not possible and that yellowfish could only be caught on baited hooks. For sound reason the February 1985 issue of Tight Lines/Stywe Lyne magazine described Van Niekerk’s pioneering experiments as the most important discovery of the previous half century. 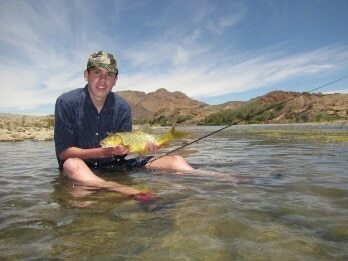 By the time Van Niekerk died on 6 November 2003, fly fishing for yellowfish was practised throughout the country and anglers sought to catch all six species found in South Africa on fly.